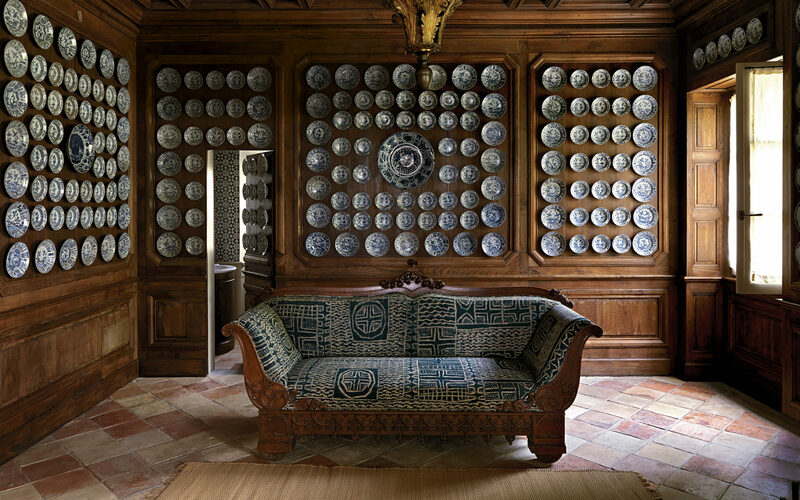 In Sotogrande, Spain, Laura Sartori Rimini and Roberto Peregalli, principals of Studio Peregalli, created a dramatic display with hundreds of pieces of Chinese export porcelain. Laura Sartori Rimini and Roberto Peregalli, partners in the venerable Milan interior design firm Studio Peregalli, both love to collect. She has a predilection for architectural drawings and portraits of men in turbans. “It’s weird,” she says of her infatuation with the latter. 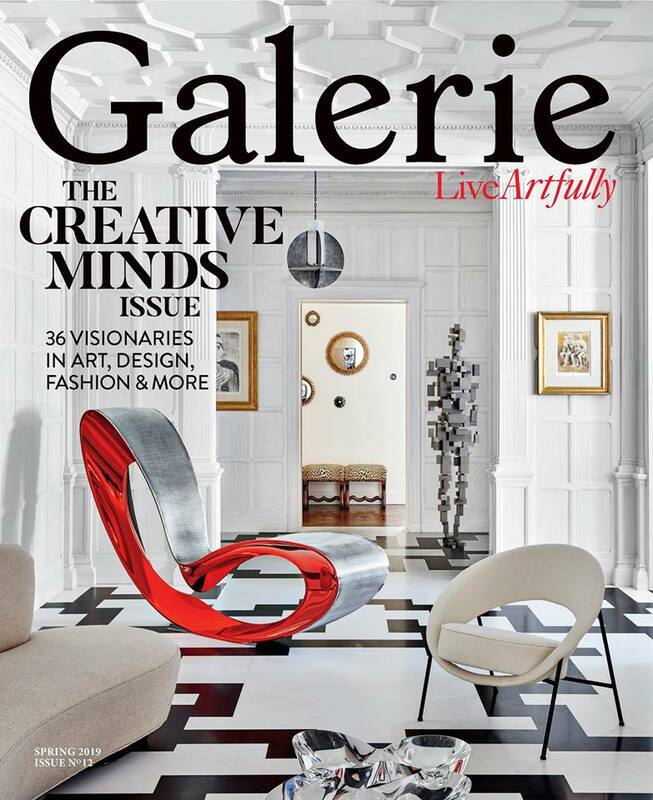 “I can’t explain.” Peregalli, meanwhile, owns some 200 gouaches by the fashion illustrator Lila de Nobili and admits to a penchant for 17th-century Italian paintings “that are a little violent or have strange subjects.” Neither takes an encyclopedic approach to acquisitions. “We’re not people who keep our collections in cupboards and need to know the exact details of every piece,” he notes. 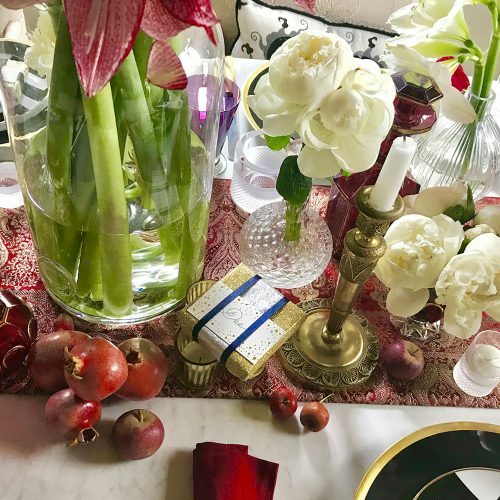 Given their creativity and obsessive attention to aesthetic detail, it’s no surprise that passionate collectors have been among Peregalli and Sartori Rimini’s devoted clients. 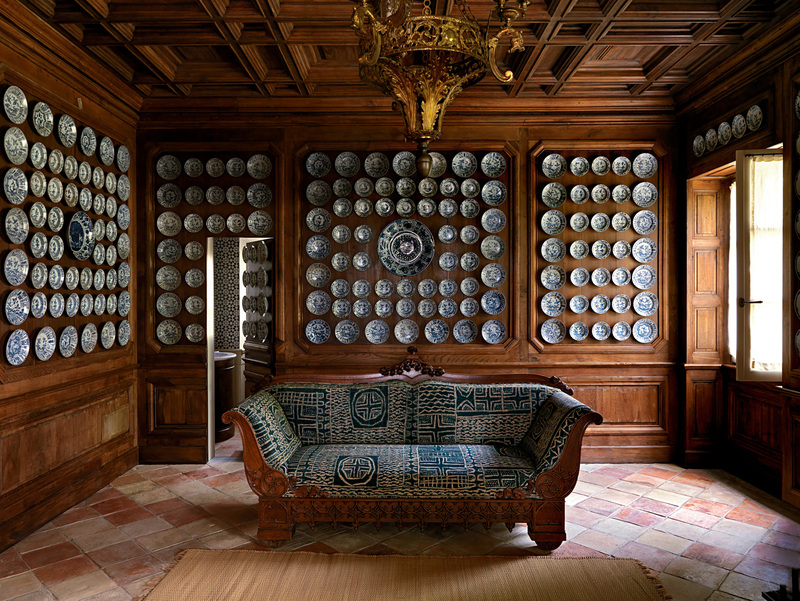 One of the most striking interiors they devised for a collector was a residence in the Swiss Alps owned by an admirer of European paintings from the late 16th to the early 18th centuries. 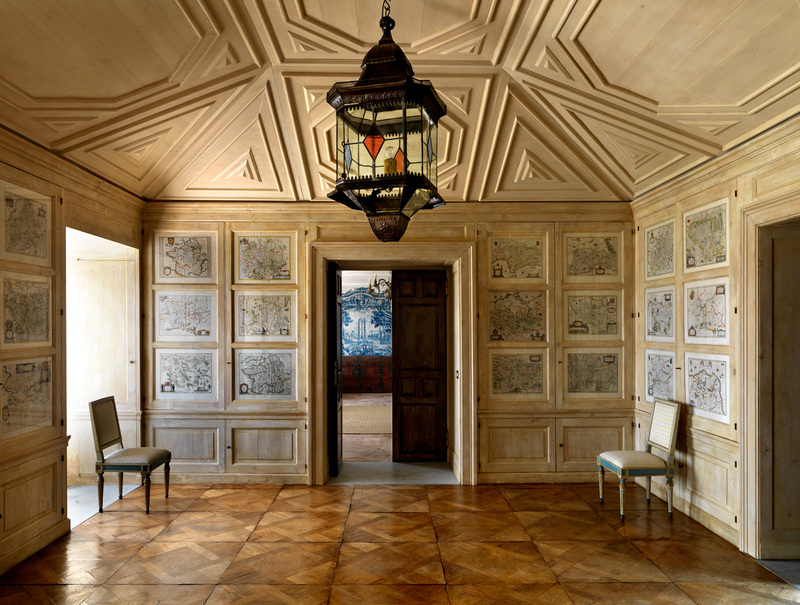 The brief was to incorporate as many artworks as possible, so the designers—taking inspiration from the Palazzo Pitti in Florence—covered almost every inch of available wall space with paintings. “We even hung them on the sloped ceilings,” notes Peregalli. The result is both dazzling and ingenious. 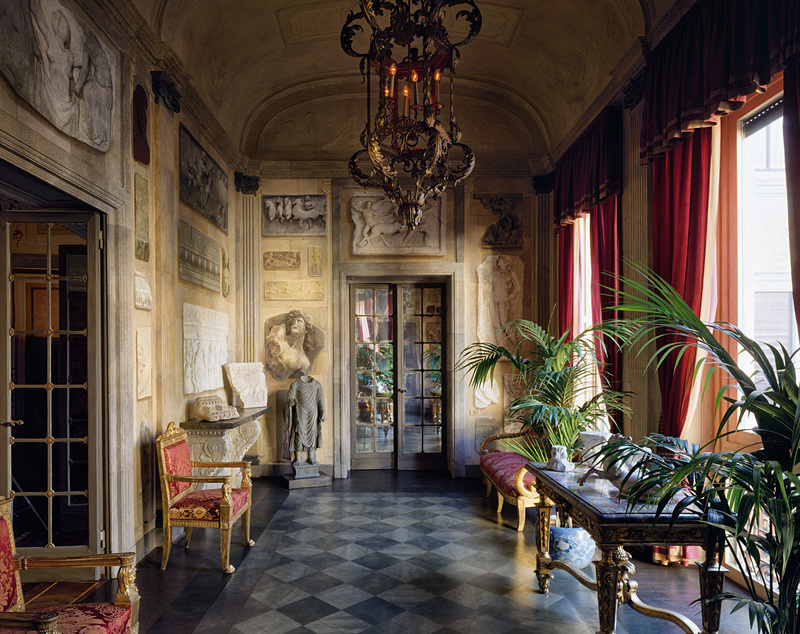 Rather less cluttered but equally distinctive is an apartment they created in an 18th-century Milanese palazzo for Emil Mirzakhanian, a dealer and collector of Asian art. 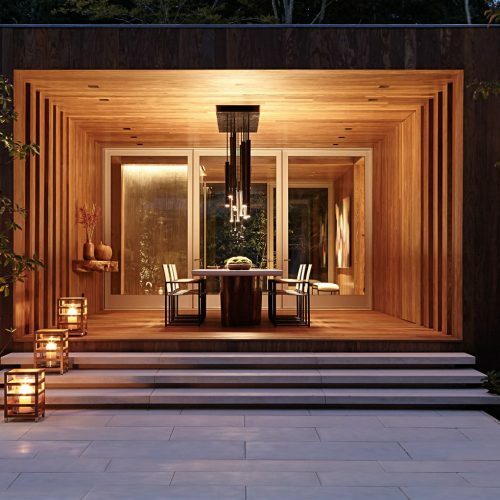 The goal here was to achieve “a sense of simplicity, of emptiness,” says Sartori Rimini. 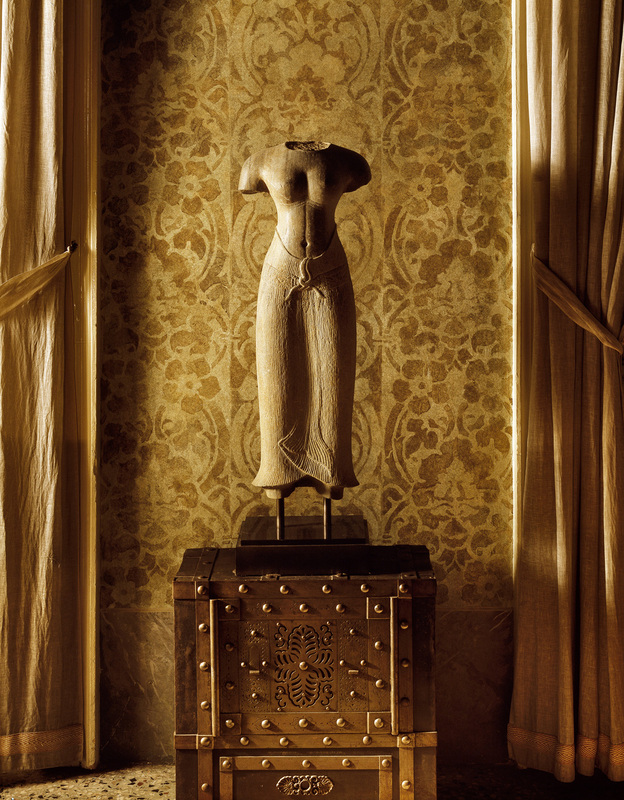 Walls were subtly decorated with stripes and floral motifs, and sculptures were strategically placed on pedestals to make them the focal points of enfilades. 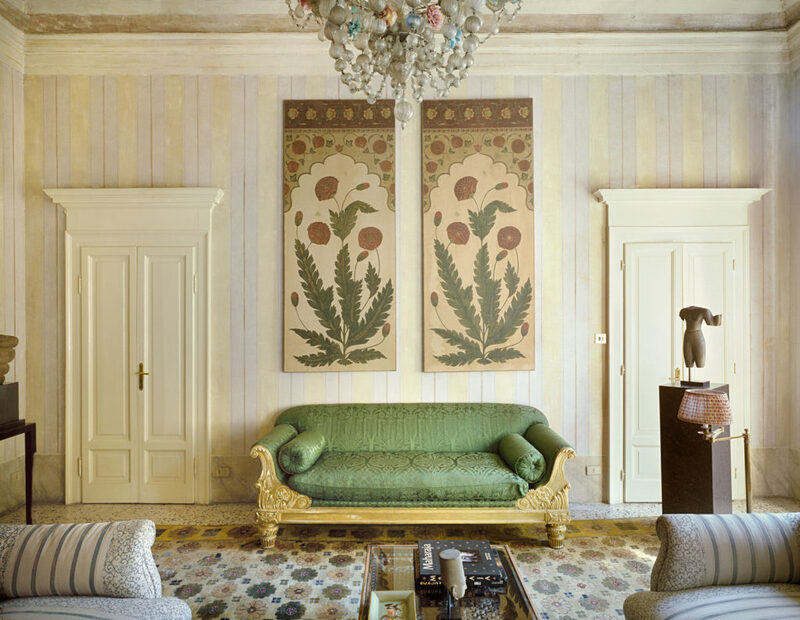 At Studio Peregalli, there are few hard-and-fast rules when designing residences for collectors, but Sartori Rimini and Peregalli are generally averse to uninterrupted expanses of white wall. 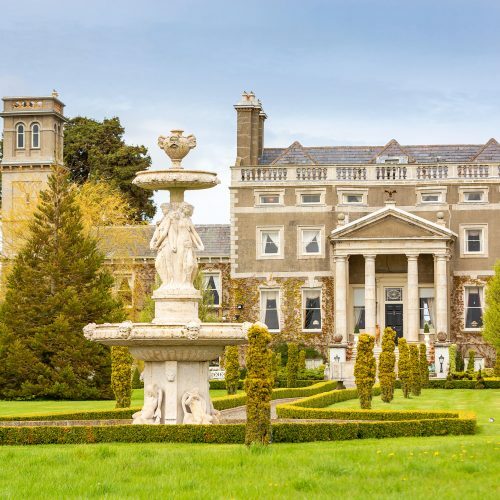 In their minds, a house should not resemble a gallery or museum. 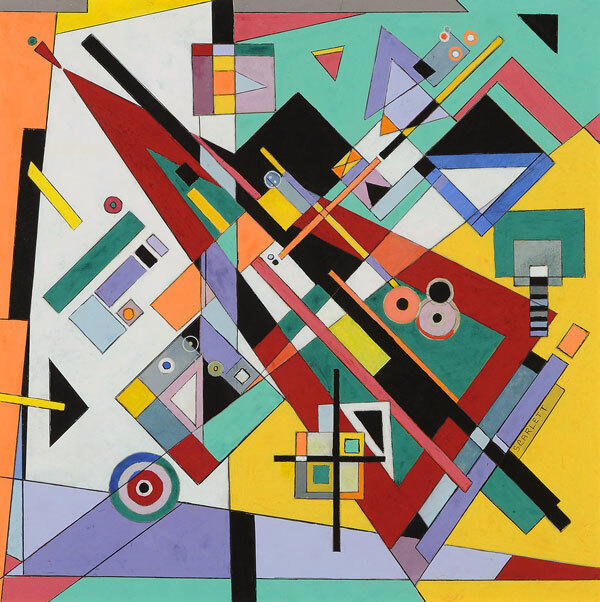 Instead, artworks ought to be integrated with the rest of the decor. 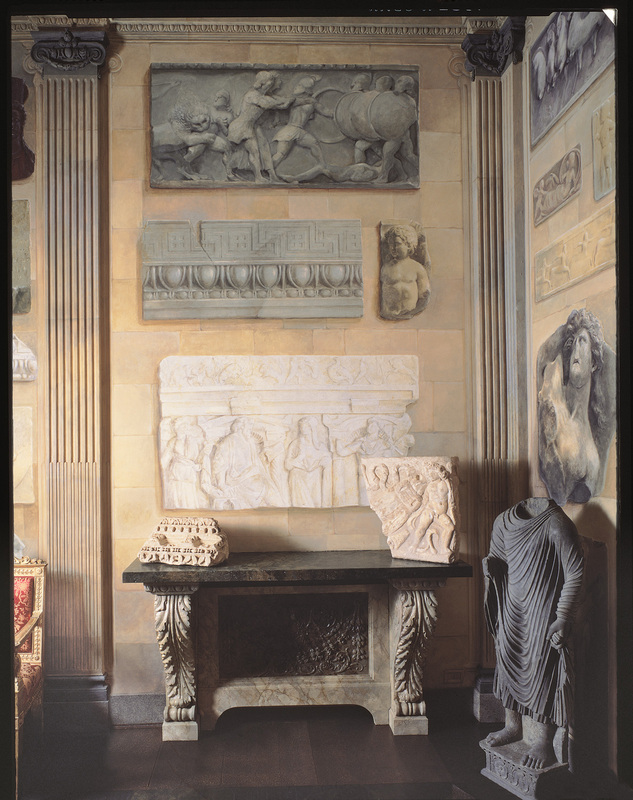 Nowhere is that philosophy more evident than in an entrance hall the duo created for a grand flat in Milan, where pieces from the owners’ collection of rare archaeological fragments stand on the floor or rest on tables in front of walls decorated with trompe l’oeil bas-reliefs that echo the ancient objects. 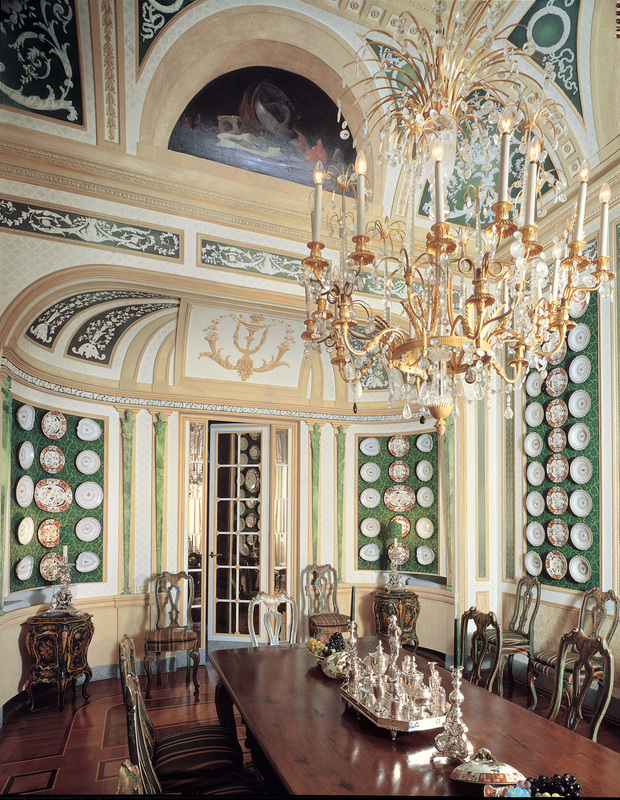 As with most of their projects, the designers declined to install picture lights to illuminate the treasures, preferring to rely primarily on the room’s dim, atmospheric glow. Peregalli and Sartori Rimini reject the idea that important works need to be flaunted and given pride of place. They often take a more understated and unexpected approach, seeking to match the art with a setting that suits the nature of the work. 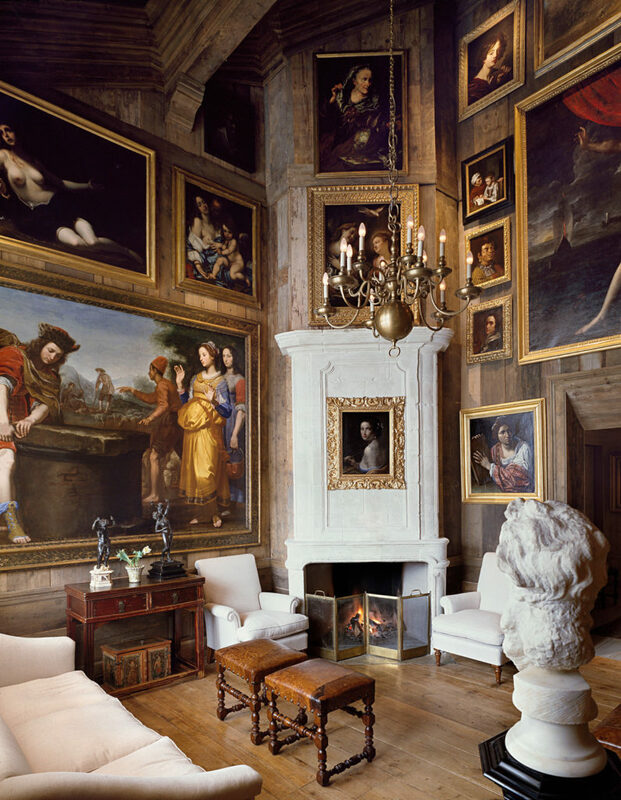 It’s a lesson learned from Mongiardino: At Marie-Hélène and Guy de Rothschild’s Paris townhouse, the Hôtel Lambert, he placed Vermeer’s famous painting The Astronomer in a cloistered study. “He said it was a private picture and was not to be seen from afar,” recalls Peregalli. Plus, Sartori Rimini and Peregalli like to inject selective touches of informality. 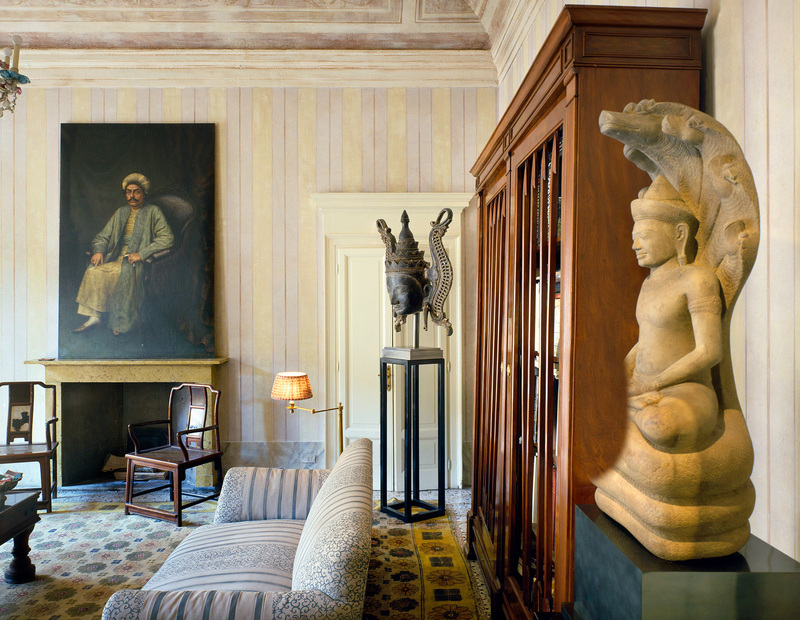 In Mirzakhanian’s sitting room, for instance, they nonchalantly propped an unframed 19th-century portrait above the fireplace. 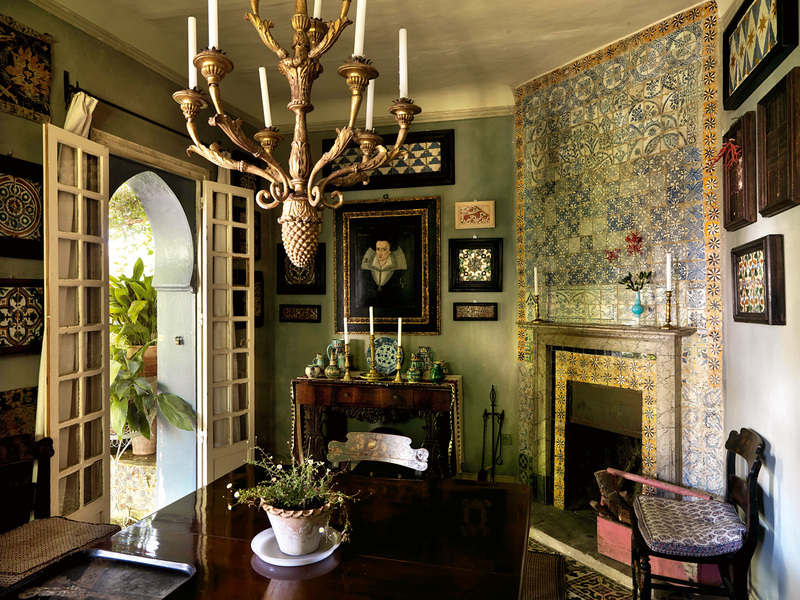 Click here to view more of Studio Peregalli’s sumptuous interiors.